The unemployment rate for veterans encompassed by the Wounded Warrior Project (WWP) has improved by 40% over the past five years, according to the organization's annual survey. The survey also reported that, for the first time in the group's history, it has exceeded $100 million in economic impact within one year, a representation of the combined total salaries of newly employed veterans served by the organization. "We invest time to fully understand the warrior's background, skill sets, and future goals," WWP Financial Wellness VP Tom Kastner said. "Then, we work on the fundamentals such as building resumes, job interview preparation, and creating more direct hire programs where warriors interact with local company representatives face-to-face." As evidenced by WWP's report of high employment rates, employers have come to the realization that they can source good talent among veterans — including those who sustained disabling injuries during their service. 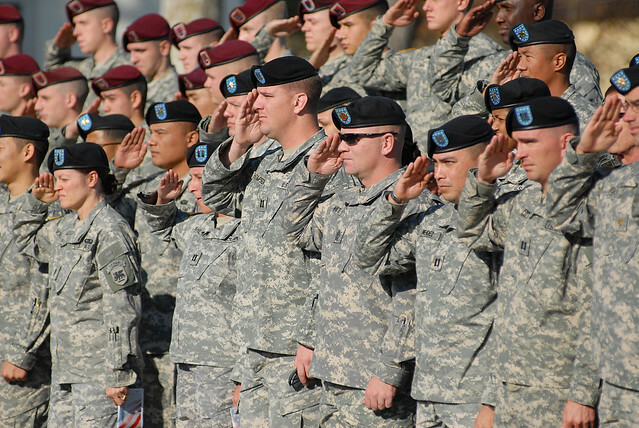 Overall, unemployment rates for service members have dropped to record lows. Walmart set a goal to hire 250,000 veterans by 2020 and Comcast announced plans to hire 21,000 by the end of 2021. Veterans often come out of military service with skills that can greatly benefit the workplace, Jeff Morin, chief of staff at Sallyport Global and U.S. Marine Corps veteran, wrote in an HR Dive opinion piece. Veterans often have technical, project management and leadership experience, he wrote. Though they're prepared in terms of skills, veterans do need support from organizations as they transition into a non-military work culture; some struggle with a less regimented environment and encounter misplaced stereotypes about military service, Morin noted. It's no surprise, then, that the employers named on Monster's Best Companies for Veterans list have plans and policies in plac to ensure the success of veteran recruitment, onboarding and retention.